Here’s a data visualization map from the NYT of changes in vote from 2012 to 2016 at the county level: red arrows to the right are counties where Trump did better than Romney. According to Reuters, Romney lost the Slippery Six states [Pennsylvania, Ohio, Michigan, Wisconsin, Minnesota, and Iowa] because (exactly as VDARE.com warned repeatedly while digging white share data out of reluctant tracking polls …), he did badly there among white voters—winning only 52 percent, six points worse than nationally. Most notably, Romney did terribly among the white working class in these six states. Thus he did only two points worse among whites with college degrees in the Slippery Six than he did nationally. But among the white “some college” component, he came in six points worse than nationally. And among the white “no college” voters, he performed 11 points worse than across the country—finishing tied with Obama. In fact (although sample sizes are getting small), Romney even appears to have suffered the ignominy of a reverse gender gap among no-college whites in the Slippery Six—winning 51.4 percent of the women, but only 48 percent of the white working class men. So the hidden story of the 2012 election just might come down to Romney not appealing to blue collar white guys in this swing region. Or you could attribute it to the immensely rich Obama campaign’s relentless negative advertising all summer depicting Romney as an outsourcing zillionaire. But, how much did Romney offer working class whites in this swing region? I suspect Romney was hurt badly by his 2009 op-ed that appeared to argue against bailing out General Motors: a real old-fashioned issue (e.g., my dad’s employer, Lockheed, was bailed out by Congress in 1971 on an extremely close vote, and Lee Iacocca became a potential presidential contender a decade later by first getting a bailout for Chrysler and then paying it back). 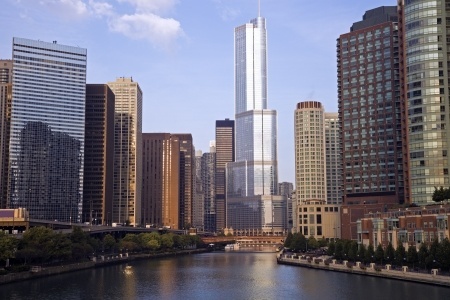 The strongest part of Trump’s business career was building huge tangible things like his 2009 tower in Chicago, which working class people admire. Romney’s business career was more abstract, which the college educated respect, but it often wound up with having the depressing tangible effect of a plant in the U.S. being shut down. To his credit, Romney didn’t seem to find his business career all that fulfilling and got out of it quite early (insiders wondered why somebody as well-positioned as Romney had been to become a billionaire wasn’t a billionaire) to go into public service full time.